Garmin zumo 340LM motorbike sat nav features a bright 4.3-inch glove-friendly touchscreen colour display. Garmin zumo 340LM features Bluetooth, Lane Assist with Junction View. The zumo 340LM is preloaded with Western Europe mapping, and what's more as the zumo 340 is a 'LM' (Lifetime Maps) model it includes FREE access to new street-level road maps for the life of the product. When a new map is available you can download it to the zumo 340 via your PC. The zumo 340LM also features speed limit indicator and you can download the latest speed camera database for a fee. You can also receive turn by turn navigation via bluetooth in your helmet. Garmin zumo 340LM has been discontinued. The Garmin zumo 340LM has been replaced by the zumo 345LM. (pictured below). Accessories are available for your Garmin zumo 340. Likewise you can buy new maps. The Garmin zumo 340LM includes 4.3-inch displays, is waterproof and rugged, has lane assist and PhotoReal Junction View, Bluetooth for navigation and road speed limits and speed camera database. The mapping on the 340LM is Western Europe and these maps can be updated as often as a new map is released for the lifetime of the device. If you want full European mapping on a Garmin zumo then we recommend buy the Garmin zumo 390LM instead. Plus, if you want to use the Garmin tyre pressure monitor accessory with your zumo you will need to buy the zumo 390LM or zumo 590LM models. Plus ride with the latest maps available with Garmin nuMaps Guarantee. Simply register your new Garmin zumo 340LM within 90 days of first using your sat-nav to see if a free map update is available. See map coverage below for more details. Rugged and waterproof to IPX,Garmin zumo 340LM is built tough for bikers - by bikers. The GPS systems have been tested on rutted-out roads, cobblestone streets, in heavy rain and glaring sunshine and the result was always the same - zumo kept on navigating. The Garmin zumo 340LM, like all Garmin sat nav's, gets its speed camera data from the Cyclops speed camera database. The database provides advanced alerts to fixed, average speed, mobile, variable, temporary roadwork, red light and red light speed cameras. As you approach a camera, your device sounds an alert. Subscription charges apply. Click here to read more about the Cyclops speed trap database. Cardo Scala Rider headsets are available to pair with your Garmin zumo 340. The benefits of buying and using a Scala Rider headset with your Gamrin zumo 340 are three-fold; 1. you can listen to sat nav voice turn-by-turn instructions, 2. listen to music and 3. communicate with other motorcyclists whilst riding (using the intercom when within range and mobile phone when out of range). Garmin zumo 340LM series is secured to your motorcycles handlebar using the supplied RAM mount and Garmin motorcycle mounting bracket. The Garmin zumo 340LM is preloaded with City Navigator NT for the UK, Ireland and Western Europe provided by here. These maps can be updated FREE for the life of the product, when you register your zumo 390LM with Garmin UK. Further Garmin zumo 340LM series maps are available on SD card which insert directly into the Garmin zumo GPS system. Available Garmin zumo 340LM maps include North America, Australia and New Zealand, Middle East and Southeast Asia. Click here to view Garmin zumo 340LM maps. The zumo 340LM includes all the accessories you need to get you up and running on your bike. However, if you'd like to use the motorbike navigator in a car/van too, you'll need to buy some extra accessories. Additional and spare parts are also available including a hard carrying case, RAM mount kit and motorcycle power cable. The zumo 340LM is preloaded with street-level road maps for Western Europe. You can however, buy maps for all of Europe and Eastern Europe, or if you want to take your bike navigation device further afield, we may have the map that you need. 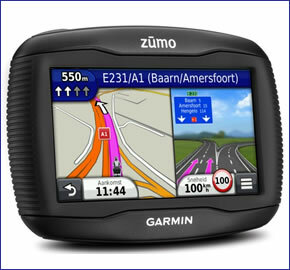 Garmin zumo maps available include: USA, Canada and Mexico, Australia and New Zealand, Morocco and Southern Africa. Question: I have a Garmin Zumo 340 LM and require a mounting bracket to fit 1.25in/ 32mm approx. dia handlebars or to suit a different mounting point on a Harley Davidson. Answer: The only motorcycle mounting bracket we sell is this one, we do not know the handlebar diameters the mount will attach with. All Garmin zumo 340 accessories can be seen and purchased online here. Question: I have a Garmin Zumo 340LM, does the Garmin GTM 36 charge the device through the usb port as well as offer traffic updates? If I connect a usb charger to the Zumo it goes into 'PC' mode and does not display mapping. Answer: The GTM 36 Traffic Receiver (pictured right) is designed for in-car use via a 12-volt cigarette lighter socket. When connected to a vehicle the GTM 36 will provide traffic, power and charging to your Garmin zumo 340LM. When connected via a standard USB cable, as you’ve found out, it will presume you are completing a download or an update and will not provide navigation (PC mode). It will however provide a ‘trickle’ charge from your PC to your Garmin zumo 340LM. Question: I have a Garmin Zumo 340LM. Is there a way I can connect this onto a Garmin Zumo 660 cradle already installed on my bike e.g. conversion face plate for the cradle or a way of utilising the existing cabling? You may be able to use the existing RAM mount kit, otherwise to complete the assembly, you will also need to buy the RAM motorcycle mount kit. View all accessories for the Garmin zumo 340LM. Question: I have a Garmin LM340 motorcycle sat nav. Can you supply a new battery for it? Answer: Garmin have never made zumo 300 series battery available as an accessory. Any comments / suggestions...do I need a new/special car connection cable? Answer: Are you using the correct and genuine parts as manufactured by Garmin? If you are, then I would recommend that you speak directly with Garmin UK on 0808 238 0000. If you are not, then I would recommend you purchase ‘genuine’ Garmin accessories, these can be viewed and purchased online here. Question: I have a garmin zumo 340lm mounted for motorcycle use and want to use it in the car. What adapters and leads do I need please? You could also receive traffic information by purchasing a GTM 36 traffic/power cable (instead of the standard vehicle power cable mentioned above). Question: Please can you confirm that I need a micro usb cable to connect my Zumo 340lm to a computer? Answer: Garmin zumo 340LM accessories can be found here. The Garmin zumo 340LM requires a Mini USB Cable and NOT a micro usb cable. Please see the 13th accessory down the page. Question: How long does it take to re-charge the battery from zero to full charge on the Garmin Zumo 340LM motorcycle Sat Nav? Answer: It will depend from what source you are charging the Garmin zumo 340 battery, e.g. USB cable connected to a PC will be slower than charging directly from the mains. For a full charge, Garmin recommend charging overnight from the mains using the genuine Garmin zumo 340LM AC Adapter and USB Cable Kit. Question: I'm wanting to mount my motorcycle Garmin zumo 340 in the car; my mount cradle attaches to a 1 inch 'RAM' ball but unsure if this product GARPFM has the same 1 inch ball or is it the smaller 5/8" (16mm) ball. Answer: Part number GARPFM is designed to work in conjunction with part number GZ3SCM.